It's never too early to make plans for a fun night out in support of survivors of domestic violence! 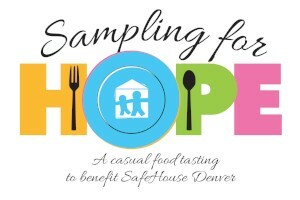 Now in its fifth year, Sampling for Hope brings together some of Denver's best restaurants, chefs, and caterers for a tasty evening. The 2019 event will take place on Wednesday, June 12th, 2019 from 6 pm to 9 pm at The Westin Denver Downtown. Keep an eye on our website or the SafeHouse Denver Facebook or Twitter pages for the most up-to-date info. This event has sold out three of the last four years, so don't miss out. Register today! Proceeds from Sampling for Hope are directed toward operating the Extended Stay Program. Interested in a delicious marketing opportunity? Email or call Heather Schreck at 303-302-6126 to learn more about Sponsorship Opportunities. Know a great Chef or Caterer who would want to participate? Click here for more information! Visit our Facebook page for more photos from the 2018 event! Read more about the 2017 Sampling For Hope in this Westword article! At the 2018 Sampling for Hope, SafeHouse Denver unveiled a powerful video about the services provided for survivors, as told by two Domestic Violence Advocates. Thank you to One Floor Up for generously donating the production of this incredible video!